As part of my print and Web Presentation Packs ongoing coaching service, I coached a member through the sale of an ad that sells puppies and kittens. As usual, I provided a great ad to work off of and a series of videos showing exactly how to sell it. It sold, as almost all of them do. What I like about this ad is that it not only worked great, but it was helping puppies find homes, which is always good karma. 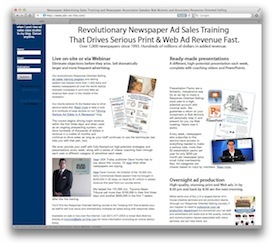 When I teach ad reps how to drive newspaper ad sales by proving the ad will work (so the prospective advertiser will believe enough in the presentation to open his wallet and actually run the right size, frequency, ad content), the first step, after getting the right information, is developing a strategy the ad rep can be confident will work. The benefit needs to relate to why people buy from one place rather than another, in this case that they're healthy and not traumatized. So that becomes the headline (under what we call the "signal" that gets the right people seeing the ad, in this case the graphic and the text at the very top). But the key is to win over skeptical readers, and if you read the ad it gets into major details about why the puppies are healthy including elaborating on the kennel itself as well as providing a warrantee and guarantee. Since price is an issue to people deciding where to buy, they also hit hard with some special offers. The ad worked really well and more importantly, using our Response Oriented Selling techniques, the ad rep was able to convince the prospective advertiser--who, of course, had an entirely different set of theories on size, frequency, and content--that it would work so they'd feel confident enough about the campaign to sign the contract. If you already have a breeder who's willing to spend some serious money on advertising and is open to ideas, show them the ad--it'll be the best thing they ever did. But, if they're like most prospective advertisers and are telling you they don't have any money, then sign up for our Presentation Packs and in a series of videos I'll walk you through the entire sale, including lowering resistance and overcoming objections. In fact, I'll get you started on the first call here.